Kabir Khan's film stars John Abraham, Katrina Kaif and Neil Nitin Mukesh as three youngsters living it up in the world's greatest city until 9/11 happens and takes over their lives. 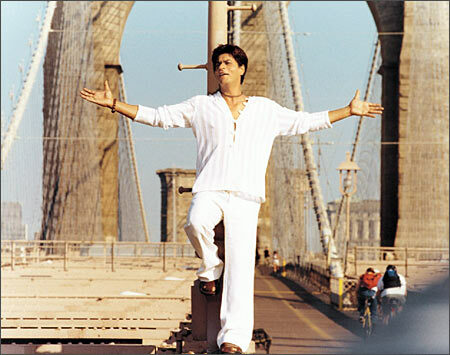 This Nikhil Advani film took the famous Shah Rukh Khan arms-raised pose straight to the Brooklyn Bridge as the superstar got into much laughter and melodrama alongside Saif Ali Khan and Preity Zinta. Karan Johar laid on the melodrama heavier than ever in this New York-based tale of bad marriages, infidelity, and a very, very weirdly dressed father figure. 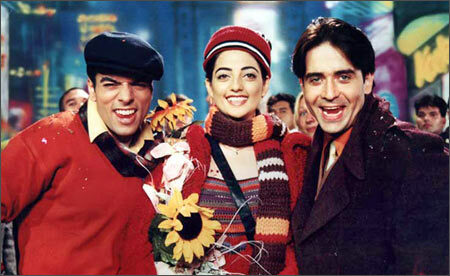 Akshay Kumar stole the show from Salman Khan in Shirish Kunder's film as the two heroes battled for Preity Zinta's affections in New York City. Much fun, with great visuals. The ever-pioneering Dev Anand was one of the first modern-day desi directors to head off to New York and make a film set in the bustling capital. The title is the best part of the film, though. Naseeruddin Shah's 9/11 film not only had Indians on board a hijacked plane and a few others in New York, but showed one of them -- Irrfan Khan -- inside the World Trade Centre watching the plane crash into the window. Siddharth Anand's atrocious racecar film with Saif Ali Khan and Rani Mukerji is set in the Big Apple, and Khan plays a native New Yorker with a need for speed. Long before Rahul Dholakia won the Best Director National Award for Parzania, he made this Gujarati Meet The Parents ripoff set in New York starring Jimmy Shergill and Paresh Rawal. Not fun. Vikram Bhatt's cacophonic take on The Whole Nine Yards stars Akshay Kumar, Sunil Shetty, Aftab Shivdasani, Johnny Lever and the city of New York. And the city does the best acting job. Rahul Rawail's rather painful film stars Sunny Deol as a Sikh policeman who finds himself in New York City working on a case and trying to nab a criminal with terrorist links.